Karl Anthony is a musician whose career has spanned more than three decades and taken him all over the globe, and he’ll be performing at our center, August 26th at 7 pm! His performances feature a synthesis of eastern and western musical styles, such as the infusion of kirtan call-and-response chants, These are mixed in with a little acoustic rock and Karl’s amazing story telling. Rady’s Children’s Hospital is where Karl Anthony sings when he is not on the road touring. He became part of the hospital’s Healing Arts Department where he and other artists work closely with hospital staff to facilitate the very best supportive conditions for whole and proper healing. He knew there was a powerful song in this young boy’s experience, and his new album, entitled “Hold the Sky,” debuting this month, features this title song. Anthony has received several Gandhi/King Season For Nonviolence Peace Hero Awards for his humanitarian efforts and innovative music. 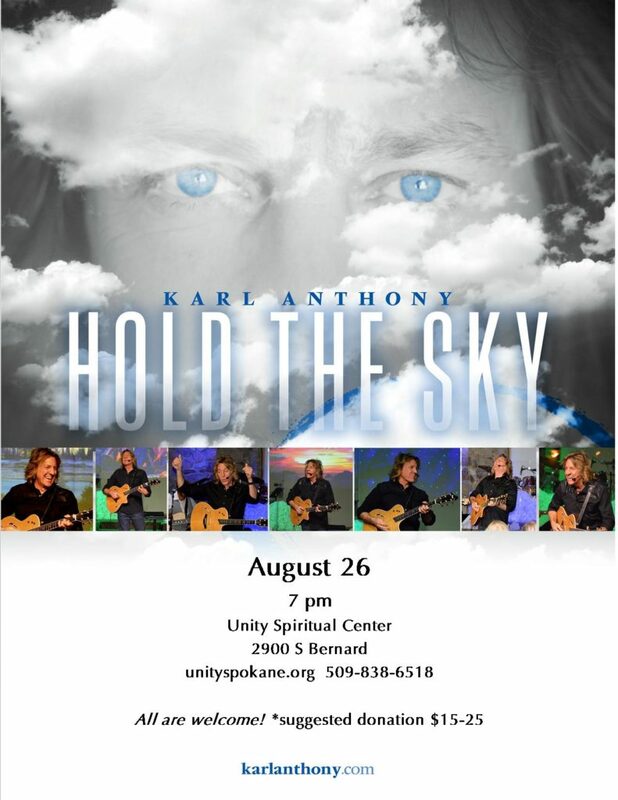 Karl Anthony is a producer, songwriter and singer but more than that he is a facilitator of authentic connection with music. Liza is the Communications Coordinator at Unity Spiritual Center Spokane and has been a member since 2007. Liza grew up in Spokane and lives with her husband and daughter in this "Near Nature, Near Perfect community."